The Museum of the Acadian Memorial features interactive exhibits, the Acadian Odyssey Quilt and images from the Claude Picard Deportation Series housed at the Grand-Pré National Historic Site. “Acadian Migration to Louisiana, 1794 - 1809” is an interactive audio presentation which depicts the Odyssey of six journeys of ten Acadian families. Jolene Adam, past curator/director, founders Janie Bulliard and Pat Resweber worked with Jules Babineaux of Exhibits, Etc. to create the project using research from Dr. Carl Brasseaux, past Director of the Center for Louisiana Studies at ULL. Jolene Adam is the voice telling of the journey in French and English. This element is now connected with the Deportation Cross. 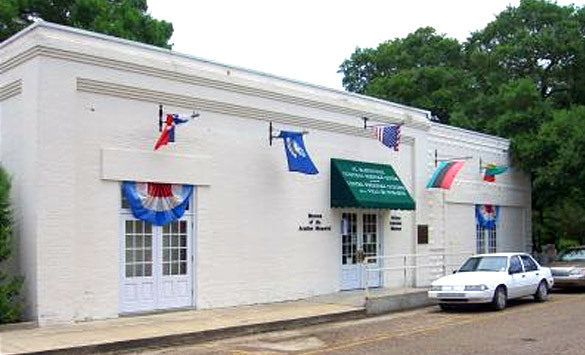 The museum is located next door to the Memorial building in the St. Martinville Cultural Heritage Center. It shares the Center with the African American Museum. Both Acadians and Africans were uprooted from their homelands, and both contributed to Louisiana's growth and unique cultures.